S&C brand founders; Steven Sabados and Chris Hyndman joined forces in 1992 and formed the design company, Sabados Group. Their energetic and dynamic approach to design allowed them to seamlessly combine entertainment and style through a series of appearances on a variety of daytime shows. It wasn’t long before the charming & creative Steven along with the dynamic and fun-loving Chris were offered their own media showcase and together they pioneered the birth of 'Design Television'. Having helped countless people create beautiful, inviting living spaces, Steven and Chris decided to turn their passion for décor and design into their own line of furniture, textiles, decorative accessories, lighting and area rugs. Beautifully crafted, the product line launched in 2007 to rave reviews across North America. In the summer of 2015 the world sadly lost Christopher Hyndman and as a tribute to Chris’ passion for design, a new and dynamic product team was created. Under Steven’s never-ending creative leadership as an artist, photographer and designer, the team continues to uphold the S&C philosophy of keeping design "timeless, fresh & fabulous". Together, the team will continue to raise the brand to greater heights with affordable products that reflect great style, easy comfort and top quality. Ninety Five & Co is synonymous with style, fresh design approaches and on-trend collections. They have tapped into a wealth of design flair and trend watching to offer fresh looks designed to target the mainstream market with fabrics picked for their beauty, quality, and wide appeal. From bright colours to timeless florals, luxury linens and iconic Canadian animals, our collections offer high quality decorative accents for any space. The complete collection is Made in Canada and delivers high quality, value, selection and on time delivery, which we have become known for. Like many great rock bands and Silicon Valley start-ups, Mercana Furniture & Décor began its operations in the Smith family garage. Back then, they were a humble framing business serving the local photography industry in Vancouver, BC. Today, they’re one of Canada’s leading home furnishings wholesalers, with retail partners located throughout North America and around the globe. As a “design-first” company, they produce several hundred unique pieces for the home each season, from lighting to framed art. Over the past 50 years, Fitz and Floyd has evolved into the undisputed leader in the design and manufacture of hand-painted ceramic giftware, dinnerware, tableware, decorative accessories and collectibles. From the drawing board to the sculpting wheel and the kiln, all Fitz and Floyd products are distinctly designed and hand-crafted by skilled Fitz and Floyd artisans. From its renowned US Studios, the Fitz and Floyd design team creates the company's exclusive designs - nearly 500 new and unique designs each year. Fitz and Floyd – often elegant, sometimes whimsical, always a prized and treasured gift. Sharon Nowlan is an artist from the heart of a little seaside town, Pictou, Nova Scotia, Canada. She creates unique and beautiful pebble art that inspires creativity in all. We are so proud to carry her collection of art pieces here at Amanda’s House of Elegance. Woodwick Candles are one of a kind candles made with a premium soy blend of waxes and beautiful fragrances from essential oils, from its feminine hourglass shaped glass container to its handcrafted wooden lid. Of course, all Woodwick Candles have a wooden wick that crackles just like a wood fire, always setting the right ambience and atmosphere. With scents such as Vanilla and Sea Salt, Warm Wool, and Bergamot and Basil, you are sure to find a scent to suit anyone on your list! We have a large variety of scents and three different sizes that range from 50 to 85 hours of a lovely crackling fire sound around your home. At Amanda’s House of Elegance, we are so proud to carry Jacqueline Kent Jewelry. This line is from Toronto and boasts unique and “one of a kind” designs. Each piece of jewellery is hand crafted with unique gemstones such as pearls, abalone shell, Swarovski zirconia, garnets, cubic zirconia, hematite and cut crystals. The metals used in Kent’s line are high quality base metals which include sterling silver, brass, steel and others. All pieces are nickel, cadium and lead compliant meeting North American safety standards and they are all hypoallergenic. If you love a stunning statement necklace this will be your new go to line. We are so proud to carry two different jewelry lines at Amanda’s House of Elegance! We pride ourselves on finding the very best of Canadian products for you and your home and these jewelry lines accomplish just that! The first is Glee Jewelry; they are based out of Vancouver and are influenced by nature and designed for beauty. The also have natural elements reflected in every piece. Glee uses a variety of high quality platings such as gold, rose gold and silver and they are all coated with an anti-tarnish polish to ensure a long life. All of the metals Glee use are completely hypoallergenic as they are nickel and lead free. All of their pieces are stunning and a store favourite. 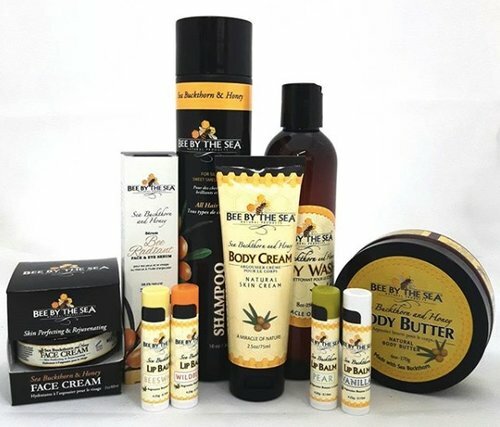 Bee By The Sea is a Canadian natural skincare company. The entire company is based around the Sea Buckthorn berry because of its healing benefits to the skin. It is the combination of this superfood, along with unpasteurized honey that make Bee By The Sea one of a kind. They promote the benefits of their products to combat eczema, sunburn, dry skin, scars and many more. At Amanda’s House of Elegance we carry a variety of their products from lip balms to hand creams and lots of things in between! This all natural bath and beauty company is based out of Kingston, ON and we carry their luxury bath salts. All plants, herbs and flowers used in their products are grown at their farm in Kingston. The owner of Farmacy always had trouble finding products that were natural enough for her skin so she decided to make her own and thats how Farmacy was created! Come to House of Elegance to check out all the different scents and formulas to find your favourite. Bomb Cosmetics makes 100% handmade bath blasters that will make your next bath even more relaxing than usual. At House of Elegance we carry a variety of bath blaster that are vegan-friendly and filled with essential oils that are great for your skin! As soon as you see how beautiful these are and how delicious they smell you will have to buy one to experience the luxury for yourself. 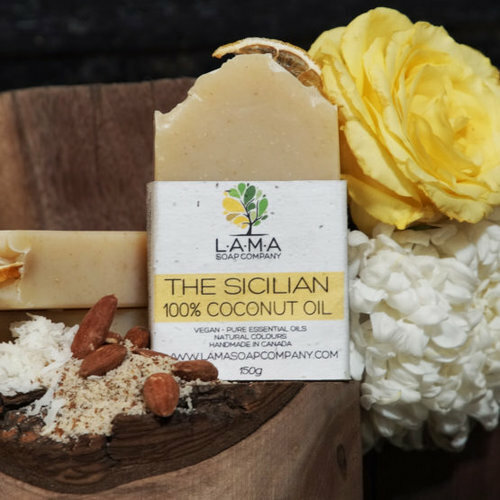 LAMA soaps are made with 100% pure coconut oil. They only use therapeutic grade essential oils for scent and their holistic properties.Each bar of soap has over an ounce of organic coconut milk and plant material are used to create beautiful colours and designs. The health of the environment is important so labels are made with recycled paper and are embedded with wildflower seeds. Make sure you plant the labels to grow food for your local bees!